San Gabriel city leaders on Tuesday rescinded a police department agreement with immigration officials, citing doubts about the arrangement’s necessity and heightened fears about deportations. The memorandum of understanding, signed by police Chief Eugene Harris in December, designates a San Gabriel police detective to act as a customs officer on a task force that investigates various types of immigration-related crimes. Although the memo states that the designated officer does not have the authority to enforce administrative violations of immigration law, city leaders said the decision should have been brought before the City Council. The partnership sends the wrong message about the city’s stance toward immigrants, said Councilman Jason Pu. He also asked the City Council to consider a “sanctuary city” resolution at a later meeting. “The city of San Gabriel embraces our immigrant communities. If the message becomes ‘Come to San Gabriel and get deported,’ it would be devastating to our community and to our businesses,” Pu said. Harris said the partnership with Homeland Security Investigations was designed to fight crimes, not deport immigrants. Contributing an officer to an HSI task force allowed the department to access federal databases, among other resources. Councilman John Harrington voted against canceling the agreement and accused other council members of playing politics. “This sends the message that politics are more important than residents’ safety,” Harrington said. The news of the agreement was met with alarm in San Gabriel, where more than half the residents are foreign-born. 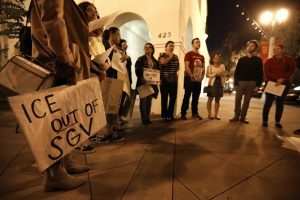 Advocacy groups and residents chanted slogans and waved signs before the Tuesday night meeting, which was so crowded that the city was forced to relocate to the nearby San Gabriel Mission Playhouse. San Gabriel’s agreement was one of dozens ICE officials have struck with local agencies across Southern California, including jurisdictions as small as Monterey Park and as large as the Los Angeles County Sheriff’s Department. The documents lay out terms for information-sharing, compensation for labor costs and in some cases, the designation of a local police officer to work on a task force with Homeland Security Investigations, ICE’s criminal investigations arm. But California’s new “sanctuary state” law largely prohibits the use of local funds and personnel on both criminal and civil immigration enforcement. Jurisdictions around the state are scrutinizing these agreements and other local collaborations with ICE, and in some cases, canceling them. Pasadena city leaders recently voided an agreement signed by police Chief Phillip Sanchez, saying that it required the signature of the city manager. Oakland city leaders canceled their agreement with ICE after activists learned that two Oakland police officers had stopped traffic during a raid that resulted in the arrests of two people. One was placed in deportation proceedings. Federal officials said the operation was targeting a human trafficking ring, but no criminal charges have been filed. In Santa Cruz, a criminal investigation targeting gang members also brought about the arrests of several non-gang members for immigration violations. The city police chief, Kevin Vogel, said he was never informed about the possibility of collateral arrests. “They misled my department as to the actual scope of the operation. I feel like I was lied to,” Vogel said. ICE officials said they told Vogel that collateral arrests of non-gang members could occur during the operations several days before the raids, which Vogel disputes. Though Santa Cruz had no agreement with ICE, Vogel warned other police departments to clarify the terms of their cooperation with ICE up front. In the San Gabriel Valley, police departments often work with immigration authorities on crimes committed by foreign nationals, such as human trafficking and visa fraud. The victims often are new or recent immigrants who cannot speak English and rely on other immigrants to navigate life in America. A detective in San Gabriel has been assigned to an HSI task force since June. The group has arrested two people it says were posing as immigration attorneys in order to charge exorbitant fees for fraudulent legal services, has investigated a counterfeit driver’s license and passport operation and is looking for the owners of 30 Chinese passports discovered in a package. These cases are typically too small to draw the attention of state and federal law enforcement agencies but too complicated for local police departments to handle with their own resources, Harris said. Both police departments and immigration authorities say these partnerships are strictly for criminal investigations. But advocates say it may be impossible to ensure these partnerships won’t include what the Trump administration has called “collateral arrests,” or arrests of undocumented immigrants who are not the target of criminal investigations. “Even if the original intent is to investigate a crime, if they find neighbors, bystanders that they believe are removable, they will also arrest and detain them,” said Angela Chan, of Advancing Justice — Asian Law Caucus and one of the coauthors of Senate Bill 54, the sanctuary state bill. Of the 111,000 immigration arrests reported by ICE between Jan. 20 and Sept. 30 of last year, about 8% were collateral arrests. And last year, ICE’s acting director, Thomas Homan, warned that more collateral arrests might be one result of California’s passing a sanctuary state bill. Agreements like San Gabriel’s, immigrant rights advocates say, often are broadly worded and rarely include consequences for violating the agreement or any mention of collateral arrests, said Ana Muñiz, assistant professor of criminology at UC Irvine. “On one hand, ICE and HSI can technically comply with agreements, but on the other hand, there are rhetorical and technical loopholes,” Muñiz said. Police officers working with HSI task forces are “not authorized” to arrest people for administrative violations of immigration law, said Jennifer Reyes, assistant special agent in charge for Homeland Security Investigations Los Angeles. But immigration officers working on HSI task forces have no such restrictions. “HSI special agents, however, have the authority to make administrative arrests during criminal investigations as part of enforcing our nation’s laws,” Reyes said. Harris said he thinks proper oversight of joint operations with immigration authorities could ensure that no local resources are used to enforce immigration law. Federal, state and local agencies work together to emphasize that public safety is a shared goal across all law enforcement agencies, Harris said. But cities are increasingly wary of the perception of endorsing the Trump administration’s immigration policies. And some city leaders, like Pu, don’t see ICE and HSI as trustworthy law enforcement partners. “The bottom line is, you just can’t trust ICE during the Trump administration,” Pu said.